We had a great run through most of summer free of white butterflies (and their broccoli-eating caterpillars) but that run ended. This is our attempt to keep the butterflies off our tender brassica seedlings and I have to say it worked out pretty well for an impromptu solution. We used some old bird netting, some spare fence posts and the wire hoops that came wrapped around bundles of posts. Straw bales hold the ends down, making it (so far) butterfly-proof. 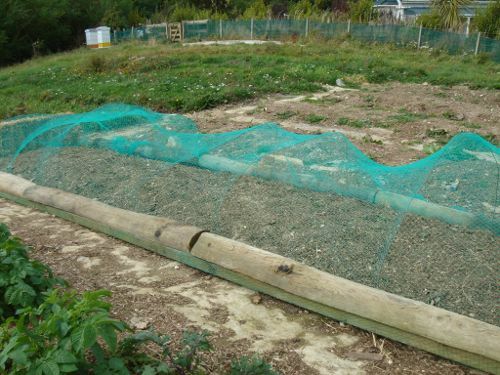 We might have to track down some more netting to do this to more beds next year. I love this use of “stuff lying around”. Most of our brassicas look like they have been taken to with a machine gun, I think we’ll have to knock something up like this next year to protect them – we used derris dust far too infrequently, and it’s annoying how it just gets washed away by the rain. I had no idea the white butterflies were a problem.